Will they decide to "make America great again" or are they with her? Voters in this predominantly white, working-class city of 77,000, set in a region buffeted by manufacturing losses, might readily align this November with presidential nominee Donald Trump for the Republican’s protectionist stance on trade. Or, given the state’s tradition of supporting Democrats, they could hew to Hillary Clinton, who also has family ties here. Bob Bolus is not shy about who he wants as America's next president. "I have a strong belief in Donald Trump," he said. "Trump's a leader; ISIS will be no more. Countries that pushed us around like North Korea, they're not going to push anymore." From "Make America Great Again" to "Build a Wall," Trump's campaign slogans adorn Bolus' semitrailer, which he has parked outside Trump, Sanders and Clinton rallies across the United States. The Scranton businessman says he supports the Republican candidate because he wants a different America — one in which the borders are closed and imports are banned. "We are going to have a balance in trade. Trucks like this will be running all over the United States again, dealing with American-made products in America, not from some foreign-made product in a foreign country," Bolus said, standing next to his trailer in a Scranton parking lot. The sentiment is not uncommon among white working-class voters in northeast Pennsylvania, says Muhlenberg College political science professor and Scranton native Christopher Borick. A recent Franklin and Marshall College poll shows Trump leads 53 to 31 percent over Clinton among non-college-educated whites in the state. "They feel threatened because of the loss of their jobs," Borick said. "They might feel, when they weave that together in the narrative, that some of that is because of trade deals or immigration — people taking their jobs." This group is partly why Pennsylvania is considered a battleground state. Disaffected workers, like Borick, are believed to have the potential to swing the former manufacturing state to the right. Residents of northeast Pennsylvania have seen companies close their factory doors and move operations to Mexico, as Thomson Consumer Electronics did in 2001. Marty Coar Sr. steps out of his family restaurant, Two Brothers Pizza, in neighboring Dunmore Borough and points to an empty lot next door. "This used to be a dress factory. My mother actually worked there," Coar said. He remembers a time when industry was bustling in the Scranton area, before trade agreements took jobs elsewhere, he says. "I could take you to 10 factories that are within 10 miles [16 kilometers] of here that are gone, because I used to pick up a lot of the garment industry. I was a truck driver," he said. While the demographics may favor Trump, he will have to overcome the state's historically Democratic voting record. Democrats have won the last six straight presidential elections at Pennsylvania ballot boxes. The state has not swung Republican since 1988, when George H. W. Bush won here. "The long roots, the Democratic strength — that is something that does not erode overnight," political analyst Borick said. "When you add on the local dimension with Hillary Clinton and her family from here, it's going to make it hard for Donald Trump to necessarily come in and just sweep an area." Clinton's father, Hugh Rodham, was born in Scranton. Her grandfather worked at the Scranton Lace Co., which closed its doors in 2002. And the Democratic candidate spent many childhood summers in northeast Pennsylvania. Scranton restaurateur Paul Cooper remembers the day in 1993 he met Hillary Clinton and her husband, then-newly elected President Bill Clinton. "She couldn't be any nicer to me. As far as I am concerned, they were really nice people. They seemed really down to earth, really nice people," Cooper said, pointing to a framed photo of the Clintons and restaurant chefs on the wall. The Clintons hosted a gathering at Cooper's Seafood House restaurant 23 years ago, following the funeral of Hillary's father, who is buried in Scranton. The Democratic presidential candidate will likely highlight her roots, as she has in the past, during a campaign stop next Monday in the city, alongside Scranton native and Vice President Joe Biden. During Clinton's last visit to the area in April, Marty Coar Jr., who now runs Two Brothers Pizza, made what he called a "Madam President" pizza topped with hot sauce. His daughter was invited to meet the Democratic presidential candidate after the rally at Dunmore High School. "How many 12-year-old girls from Dunmore, whose father made a pizza, get to meet someone of that stature?" the younger Coar asked. "I mean, she is a brilliant woman, she is smart. So, if you are a young girl, that shows you can do something with your life." 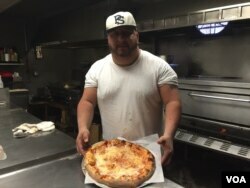 The pizzeria owner says he understands why some in the state may be leaning toward Trump, remaining loyal to Clinton or simply disaffected by either candidate's campaign promises of change. For his part, Coar does not want to talk politics, but he has a message for any politician who will listen. "Worry about the working people," he said. "We are the people that make America great. Not Trump, not Hillary. It's the people." Can Americans Still Talk Politics and Be Civil? Divided America: America's Beauty Hasn't Faded. Has its Greatness?